The off-season is typically used for National Hockey League clubs to make tweaks to their roster and re-sign their organization’s restricted free agents. Generally-speaking, negotiations become more tense and contentious as the cap hits involved grow – more important players demand larger cap hits, but their contracts also make the margin for error razor-thin. Because of the rather small cap hits involved, the Calgary Flames’ negotiations with third pairing defenseman Brett Kulak weren’t expected to be particularly important or contentious. But for a few reasons, these negotiations raised in stakes all the way to salary arbitration. The Flames have had success in the draft in recent years, but much of their success has been in the early rounds. Sean Monahan, Sam Bennett and Matthew Tkachuk went directly to the NHL after being drafted, which has in some ways inflated the club’s developmental success rate. Kulak is one of the first recent examples of the Flames drafting and developing a useful depth player. A fourth round selection in the 2012 NHL Draft, Kulak played three seasons with the Vancouver Giants. When he went pro in 2014-15, a log-jam in the Flames’ affiliate in Adirondack pushed him to their ECHL team, the Colorado Eagles. He played well in the ECHL, earned a promotion to the AHL, and even got a game in at the end of the NHL season. The next few seasons saw him pushing for additional NHL time, increasing his big-league games to 8 in 2015-16, 21 in 2016-17 and 71 in 2017-18. After being useful depth for the Flames on the farm, he crept into full-time duty last season and pushed Matt Bartkowski to the press box. He seemed primed for a raise from his league-minimum $650,000 contract, but probably not a substantial one given his modest NHL sample size and low offensive production. Instead, he found himself put on waivers and in the midst of a surprisingly contentious battle of wills with Flames management. The Flames did not have a great season in 2017-18, as that’s seemingly crept into negotiations with their restricted free agents as general manager Brad Treliving shared with Postmedia’s Kristen Anderson. Kulak’s arbitration hearing was the first of five the Flames had scheduled. The other depth bodies up for new deals at the time included bottom six forwards Mark Jankowski and Garnet Hathaway and backup netminder David Rittich. A hard-line stance with Kulak – their arbitration offer was another league-minimum contract – was likely as much about setting a tone for future negotiations as it was keeping costs for a depth defender down. 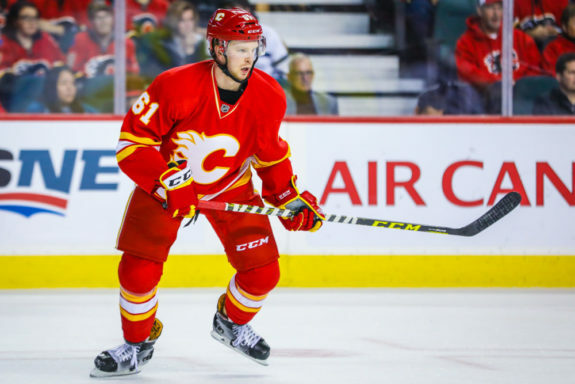 The Flames disappointed last season for several reasons, and Treliving attempted to address those areas by adding key bodies in key roles – such as James Neal, Elias Lindholm, Derek Ryan and the still-unsigned RFA Noah Hanifin. Spending assets and contracts on these bodies have tightened things for the Flames cap-wise heading into the dog days of summer. They have many mouths to feed and have chosen to feed their core, long-term pieces. In order to do that, they have to keep costs down elsewhere in the lineup and playing hardball with Kulak is one of the ways Treliving’s chosen to do so. While Kulak was one of the first useful depth players drafted and developed by the Flames in recent years, the club’s development skills have progressed since then and they have several inexpensive depth options in their system on defense and at forward. Between belt-tightening and an increased supply of inexpensive depth options, players like Kulak may suddenly become expendable if they become too expensive.